With Home Chef, you can enjoy healthy and delicious meals, without the hassle of planning or grocery shopping. Choose from 18 meal options every week, with choices that meet a variety of dietary needs, including vegetarian, low-carb and low-calorie. Fresh ingredients are delivered to your door, along with simple step-by-step recipes and nutritional information. At $7.99-$9.95 per serving, you can prepare dinner in around 30 minutes. What’s Unique About Home Chef? Home Chef’s meal plan has clear and simple-to-follow recipes. Every recipe opens into a step-by-step guide to creating the perfect dish. It’s foolproof. From how to slice the vegetables, to what seasonings to add and when, this meal kit is ideal for any cooking level. Packaging and shipping materials can be very dangerous for the planet, and if meals are being delivered every single week, this can really have an effect. Home Chef is dedicated to safe and eco-friendly disposal of its packaging. Everything from liners to gel packs - can be safely recycled. Home Chef has mobile apps for both iOS and Android devices. You can access the weekly recipes, keep track of orders and deliveries, and even review meals and send feedback from your handheld device. For every friend who downloads the app and tries out the service, you’ll receive $30 in vouchers. In addition to regular meals, Home Chef also offers diverse smoothies and fruit baskets as optional add-ons to your orders. For people who are dieting, and want to curb their sweet tooth with healthy options, these are competitively-priced alternatives. The Kitchenware section of the Home Chef website allows any budding chef to buy things to stock up their own kitchen. You’ll find everything from pots and pans, to zesters, peelers, and seasonings. Getting your own Home Chef plan is about as easy as it gets. You just enter in your email and location, and the site will start walking you through the process of building a unique taste profile. Now, it’s not a dating site, but Home Chef does want to know what you’re into and if you have any deal-breakers. You’ll be taken to a page where you’ll fill out your taste preferences. Decide how many people you’ll be cooking for—2, 4, or 6—and how many times a week you’d like to cook a Home Chef meal—2, 3, 4, 5 or 6. Note whether you prefer meat, seafood, or vegetables, and if you are looking for low-calorie or low-carb meals. Finally, you can select which food you want to avoid, including pork, soy, shellfish, and nuts, among others. On the next page you’ll be asked to give your shipping details and schedule your first delivery. You’ll then fill out your preferred method of payment, which can be credit, debit or PayPal. The standard process will charge you every Friday, but you can skip a delivery or cancel at any time. Make sure to cancel by the Friday before your next delivery at midday CST, or you may still be charged. You can plan your menus and meals up to 5 weeks ahead using the calendar and menu features. After completing payment details, it’s finally time to pick your first batch of Home Chef meals. This is where the fun begins. Choose from 18 tasty options every week. Your Home Chef meals for the week will come in a fully-recyclable box, with each of the week’s recipes printed on colorful, easy-to-follow recipe cards that you can keep in a binder supplied by Home Chef. With Home Chef you can select plans for 2, 4, or 6 people per week, and also stipulate whether you’d like to cook 2, 3, 4, 5, or 6 meals per week. If you’re cooking for kids, the company suggests that a kid’s portion be counted as a half portion. Home Chef offers 18 meals to choose from every week, including a few 5 minute lunches. You will also have the option to add a smoothie or seasonal fruit basket for $4.95 per serving. The meal options you have per week will be affected by the preferences that you specified when you signed up. Even if you didn't set any preferences, the site will still state if the recipe has specific qualities to look out for, including nuts, soy, dairy, and if it’s heart-healthy or low carb. Most weeks, you can also choose an optional premium meal, such as the “blue cheese-crusted filet mignon,” at $19.95 per serving. These meals usually require a little more effort to cook, and cost significantly more than the standard meals. Keep in mind that with Home Chef you always have the option of adding a delicious fruit basket, smoothie, or dessert on any given week for only $4.95. The company’s “5 minute lunches” are also a nice go-to item to get you through the day, and cost a little less than the dinner meals, at only $7.99 per serving. Shipping costs $10 per order if your order is under $45. Once you go over $45, all shipping is free, so it may pay off to order an extra meal or a dessert if it pushes you over the finish line. Home Chef delivers to 98% of the United States, so chances are you will be within the delivery area. Nonetheless, during signup, when you enter in your zip code the company will let you know if delivery is available to your area. Home Chef is also set up well for the holiday season or as a go-to birthday gift, with electronic gift cards that you can easily order through the site for an amount of your choosing. 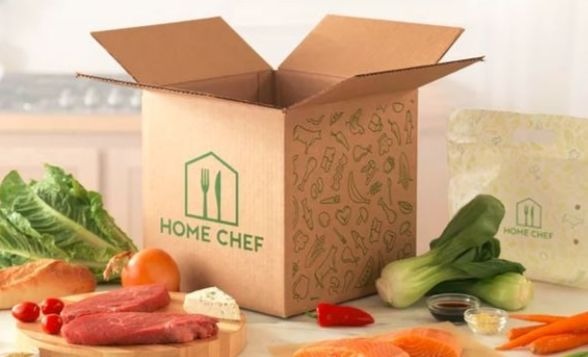 A big part of the fun with Home Chef is cracking open that box waiting on your front porch. It’s not quite Christmas morning, but don’t be surprised if you get a kick out of it. Inside the box you’ll find a special insulating lining as well as cooling packs to keep your food at a safe temperature until you’re ready to cook things up. The box comes with your recipes for that week printed on colorful, easy-to-follow recipe cards that you can collect in your own Home Chef binder. The ingredients for each of the week’s meals will come in separate, clearly-labeled packages, so keeping things organized should be a cinch. The proteins for that week will come in a separate package which has extra cooling packs. Part of the draw here is that each recipe includes exactly the amount you need of each ingredient so you don't need to worry about guesstimating what you need or throwing away unused produce. The FAQ section is categorized to help customers find exactly what they are looking for quickly. If you’re still looking for more information, Home Chef has a live chat function on its website, as well as a phone line during business hours. You can reach out via social media too, with Facebook, Twitter, Instagram and Pinterest accounts all manned by helpful staff. Home Chef is a simple-to-use meal delivery service with an emphasis on tasty, nutritious food for all. It works for all taste palates and provides solutions for people with special dietary requirements and allergies. Meals are transparently priced between $7.99 and $9.95 per serving, shipped in eco-friendly packaging, and include simple step-by-step instructions. Home Chef is a creative alternative for meal-time, making food interesting and delicious.